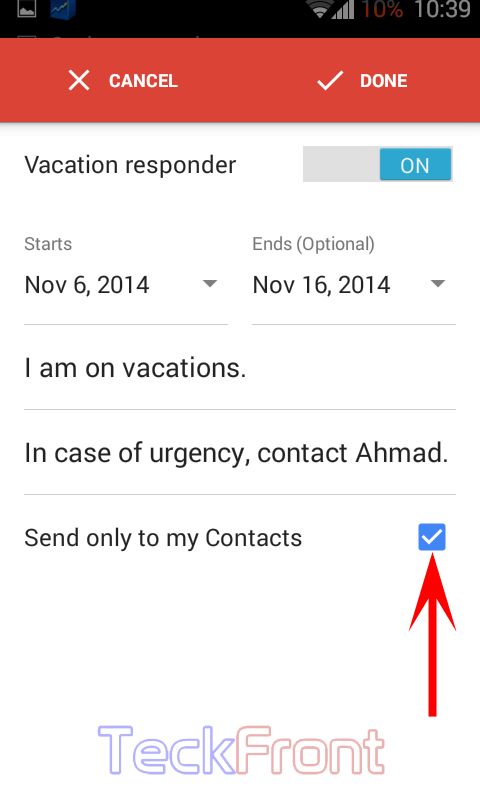 Configuring Vacation Responder in Official Gmail App of Android 5.0 Lollipop. 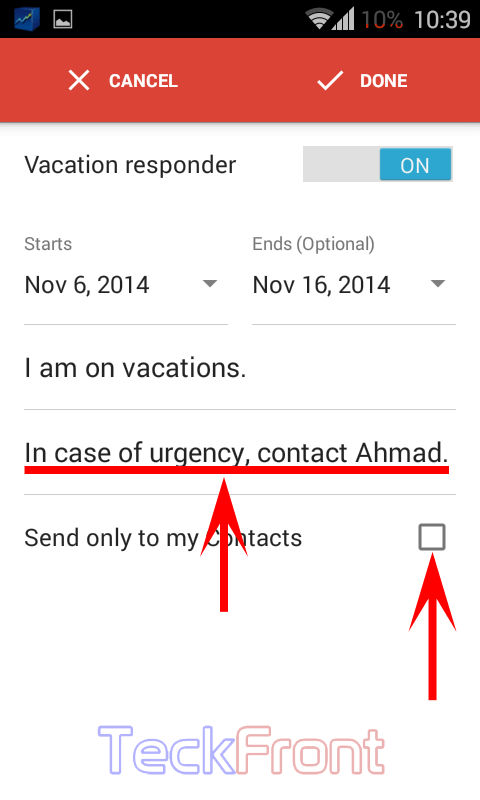 Vacation responder, a unique feature in Official Gmail app of Android 5.0 Lollipop, can be used to inform the email sender about your vacation period. It can be used to convey the email sender about the vacation, vacation period or any specific message. For example you may convey the message to the email sender to contact some other person, if the matter is of urgency or something like this. Configuring the Vacation responder, as per your need and desire is easy and you can do it in few steps and with just few taps. But, better it is to take care of the following before attempting this change. Download and install the Official Gmail app for the Android 5.0 Lollipop in your Android phone. 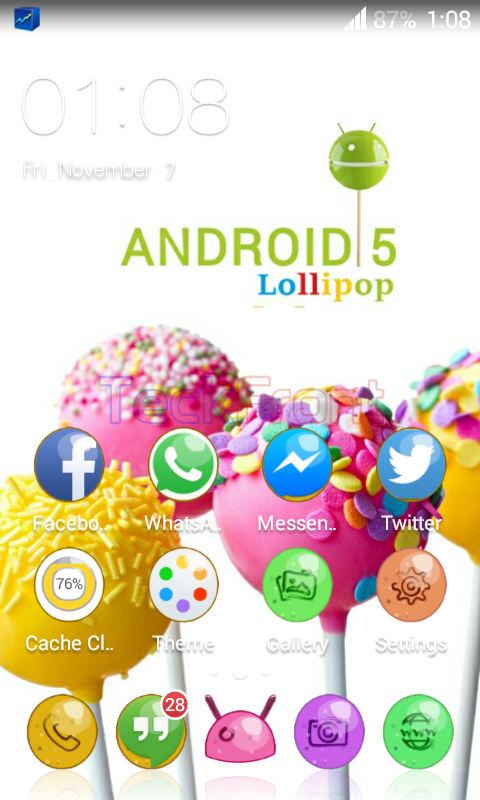 This app can be installed in Android 4.3 & 4.4.X (Jelly Bean or any version of KitKat 4.4). 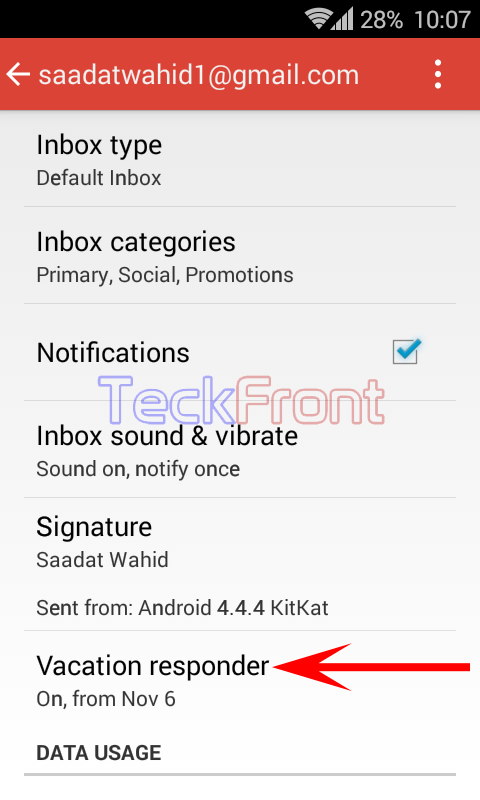 To download and install Gmail app in your Android device, you may visit: Download the official Gmail 5.0 apk with Material Design and multiple accounts from Android Lollipop. 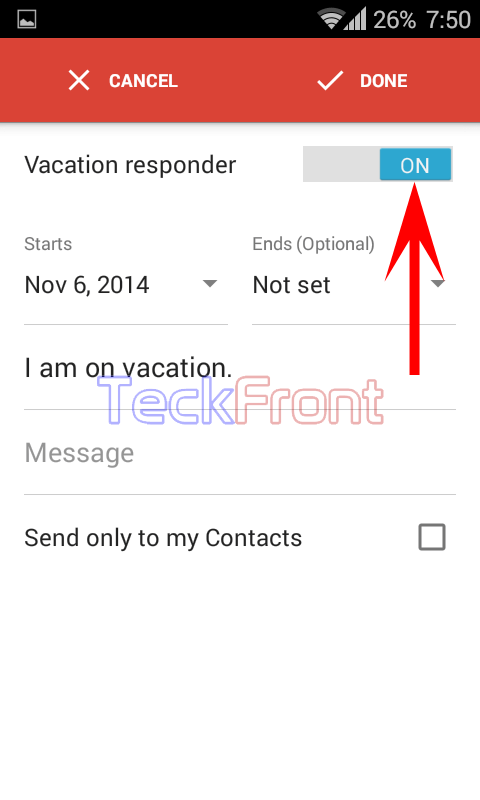 If the Vacation responder is not activated in your Android device, visit our previous article: How to Activate Vacation Responder in Gmail App of Android 5.0 Lollipop? Ensure that your Android device is connected with Internet or the Gmail app may not respond. 1: At the Gmail app’s account holder’s settings screen, ensure that the status of the ‘Vacation responder is activated and is displaying the status: ‘On, from Nov 6’. 2: Tap the ‘Vacation responder’ to configure it. 3: See the ‘Vacation responder’ is switched ON and is highlighted with Sky Blue color. 4: See the ‘Starts’ is marked as ‘Nov 6, 2014’. Tap it to set it as per your requirements. 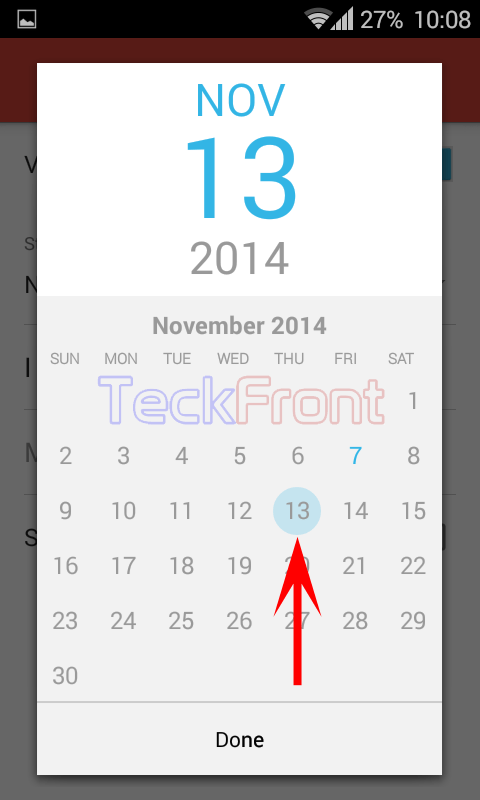 It will open up a popup calendar. 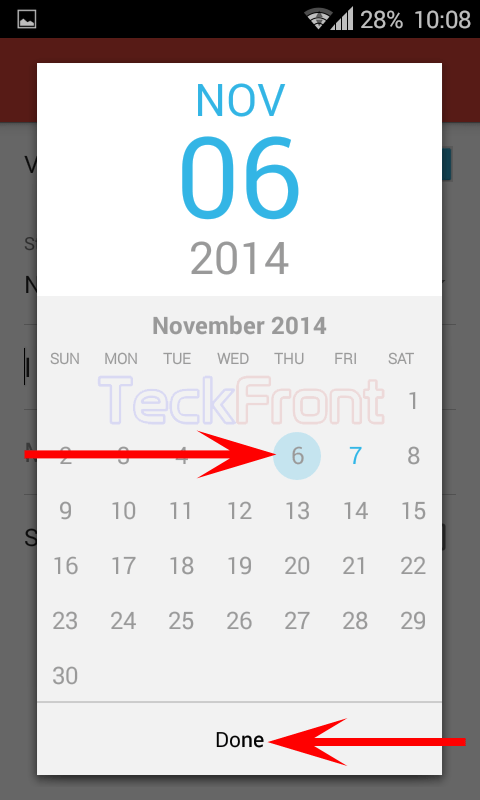 6: If you do not want to choose ending date, tap ‘None’. 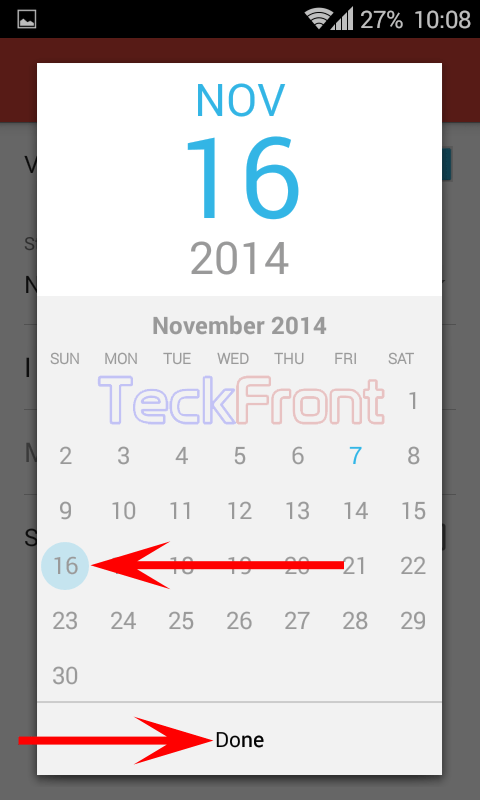 7: If you want to accept the one week vacation, ending on Nov 13, 2014 (as suggested by Android as default), tap ‘Nov 13, 2014’. 8: If you want to customize the ending date, tap ‘Custom’. 9: I tapped ‘Custom’. It opened up a calendar. Here, I selected Nov 16, 2014 as ending date and tapped ‘Nov 16’ and tapped ‘Done’ at the top right corner of the screen to save it. It took me back to the previous screen. 10: See the status of ‘Ends (Optional) has been changed as done on previous calendar. 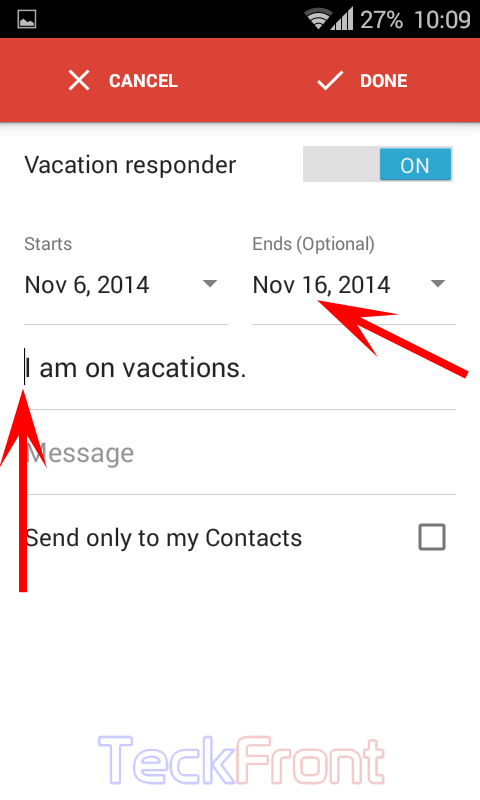 11: If you want to change the subject, tap the ‘I am on vacations’ to change it. It will open up a keyboard, at the bottom of the screen, with the help of which you may change / write the new subject. Tap the ‘Done’, at the top right corner of the screen. 12: If you want to convey some message as well, tap the space for the ‘Message’ and you may write the message with the help of keyboard, given at the bottom of the screen. To save the message, tap ‘Done’. See the message is there on the space, reserved for the ‘Message’. 13: If you want this message to be conveyed to all and sundry, do not check ‘Send only to my Contacts’. 14: If you want to keep your plan of vacations secret due to some other reason, tap the ‘Send only to my Contacts’ to check it. Then, your message will be conveyed to the persons who are in your contact list. 15: After all the settings, tap ‘Done’ at the top of the screen. It will take you back to the previous screen. 16: Go back to previous screen and see the status of the ‘Vacation responder’ which is changed to ‘On, from Nov 6 to Nov 16’. 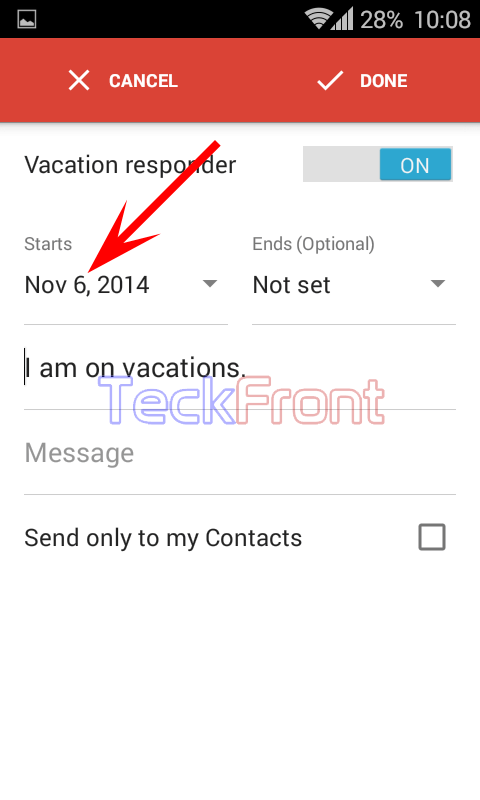 Older How to Activate Vacation Responder in Gmail App of Android 5.0 Lollipop?